Jar 1: Roll 2 dice, add for a sum and add 10 more. 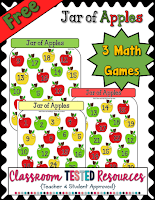 Students cover the apple in the jar with that sum. The first player to cover 10 apples is the winner. Jar 2: Roll 3 dice and add for a sum. Players cover the apple with the sum. Jar 3: Roll 2 dice and multiple the two numbers for a product. Players cover the apple with the product on it. Again, the 1st player to cover 10 apples is the winner. These fun game are perfect for back to school. A great way for students to bond together while playing games. And the best part, they are working on their math facts! Ahhh.... music to my ears. Students learning and having fun! What can be better than that?